﻿﻿﻿﻿﻿﻿﻿﻿﻿Upper Gulf Coast beach park comes back after two knockout hurricane punches. ﻿﻿﻿﻿﻿﻿﻿A bruised and battered Sea Rim State Park once again has struggled to its feet after two devastating punches from Mother Nature knocked it to the canvas in 2005 and 2008. Park supporters and dignitaries gathered in June at the beachside park to hail Sea Rim’s rebirth after it was destroyed first by Hurricane Rita and three years later by Hurricane Ike. Since the 4,100-acre Southeast Texas park partially reopened in 2010, visitors (78,000 last year) have had to rough it during day visits or primitive beach camping excursions, bringing their own water and using portable toilets and a self-pay station. A grand reopening event unveiled a host of park improvements, including an elevated dune boardwalk with rinse showers, two vault restrooms, a full-service cabin, a walk-in day-use area with picnic tables and grills, and an oceanside campground. 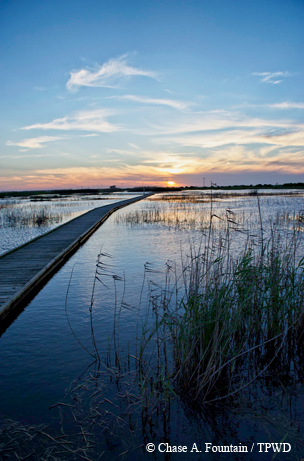 ﻿The Gambusia boardwalk allows up-close views of nature at Sea Rim. The new Piping Plover camping loop, which is sporting new paved roads and vault restrooms, features 15 campsites with water and electricity (30- and 50-amp) that rent for $20 a night. Primitive beach camping costs $10 a night. Visitors 13 and older pay a $3 entry fee per day. Recent improvements were made possible through a $2 million appropriation from the 81st Texas Legislature in 2009 for the removal of storm debris and destroyed facilities, development of a park master plan and implementation of the first stage of a two-phase park redevelopment plan. All facilities are being rebuilt to better withstand strong winds and flooding that occurs during periodic tropical storms and hurricanes. Visitors who seek out this somewhat remote state park, accessible only by traversing highways south of Port Arthur and west of Sabine Pass, are rewarded with solitude, plentiful wildlife and a chance to enjoy 5.2 miles of Texas beach in its mostly natural state. There is both drive-on and pedestrian access to the beach. Birders, hunters, anglers and paddlers tend to frequent the much larger marsh unit that’s separated from the D. Roy Harrington Beach Unit by Texas Highway 87. Sea Rim State Park derives its name from the portion of the Gulf of Mexico shoreline where inland mud flats and tidal marshes meet the sea. The state purchased the property in 1972 and opened the park to the public in 1977. To get a close-up look at some of the park’s abundant wildlife, visitors can stroll the less-than-a-mile-long Gam­busia Nature Trail to look for American alligators and a variety of waterfowl, raptors and migratory species like blue buntings and black-and-white warblers at this noted Great Texas Birding Trail location. Gulf Coast restoration funds resulting from the settlement of the Deepwater Horizon well blowout will fund a future coastal dune restoration project that will include new sand fencing, replanted dune vegetation and interpretive signage. Sea Rim may also benefit from BP spill early restoration funds proposed through the Natural Resource Damage Assessment. Those funds would pay for wildlife-viewing platforms, a restroom and a fish-cleaning shelter. For additional park information, visit www.tpwd.state.tx.us/searim or call (409) 971-2559.